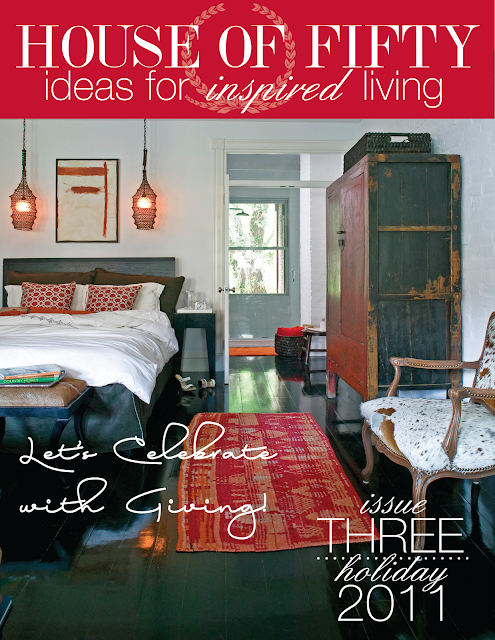 The holiday issue of House of Fifty came out yesterday! I only had a chance to "flip" through it quickly but was really impressed by the content. Janell has truly outdone herself. I am so thoroughly impressed. And even better, you can order it in print! With this crisp cold weather I can't wait to curl up by the fire with a coffee cup in hand and laptop and really delve into the magazine. Ewwww! Rodents!!? the worst!! Hope you get that sorted out soon!! As for the mag, looks totally lovely!! Thanks for stopping by the other day! I have been keeping myself busy and visiting other blogs has somewhat gone to the wayside!! Hoping to come up for air soon!! Rats!!!! Better than snakes. Just read about a long tropical snake that came down the rain gutter at an apartment building in Sweden. Landed on an old couple's balcony! I'd take the rats any day! I have flipped through but need to go back and digest more :) It's really good stuff! !